I obtained a DVD of The Man Who Shot Liberty Valance free with a Sunday News paper and was pleasantly surprised how much I enjoyed it. The fabulous cast, the frame story, and especially the ending, really did it for me. Give me some melancholy with my feel-good, and I’m happy. I agree with you that it’s kind of a bittersweet film, but most of the best ones are! Thanks for stopping by. For me this is a perfect James Stewart picture and it was a pleasure to re-watch it. Thanks for reading and sharing your thoughts. 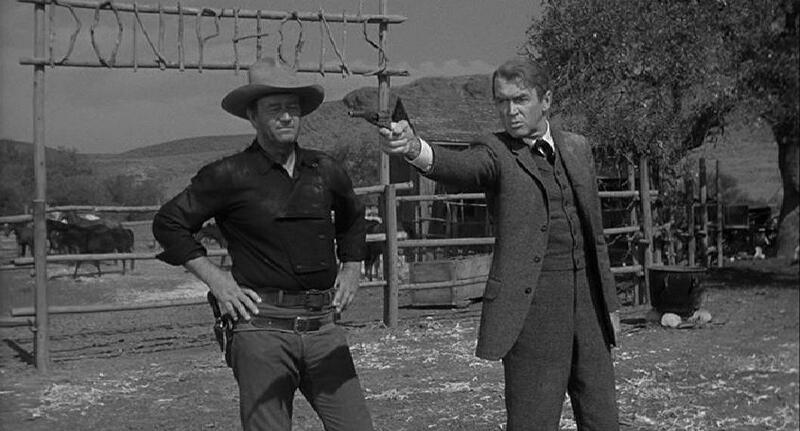 The story of “The Man Who Shot Liberty Valance” gives much to consider about the nature of truth, lies and politics. The emotional performances of James Stewart and John Wayne are complimentary to each other and the script. A film that seems to get better with time. I agree with you. Thanks for reading. I agree with you about the unconventional elements of John Ford’s work. Even the title isn’t specific and leads the viewer into a very different Western experience. It’s quite thought provoking and clever. Excellent film. Insightful post! Such a fabulous cast. In fact, I’d overlooked this a a ‘Stewart’ movie, because somehow it’s always Wayne and Marvin I remember – probably because it’s a genre I associate with them. I remember re-watching this last year and being surprised at how different I read the characters from my first viewing – it’s certainly one that gets better every time! Funny because for me this has always been a Stewart movie not a Wayne’s one 😉 Thanks for stopping by. Thanks Leah for your nice words and for reading. Now that you mentioned it, this film is indeed an uncommon western. But it’s still a very good one, with the incrdible idea that, if th legend is better than the truth, print the legend. Thanks Le for reading and sharing your thoughts!